So currently, I’m in the midst of preparing everyone for a crazy Ensemble camp here in July. And what’s better than a bit of competition mixed in to some ensemble work?! 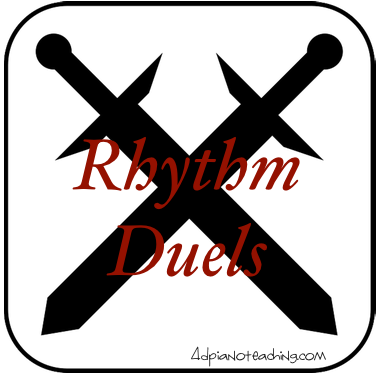 Thus I came up with Rhythm Duels for our recent group classes. After dividing students into groups of 2, I gave each group one of the Rhythm Duel sheets. Each printable sheet of Rhythm Duels have two 8 measure parts of rhythms in various levels. First I had my students learn both parts together. I asked each pair to write in whatever counting they preferred – this could be Ta’s and Ti-ti’s or 1 + 2 +’s. Then they practiced each taking a line and counting together slowly while clapping separate parts. Duets but with rhythms so my younger students could get a bit of practice at ensemble work. Then we had them perform for each other with twists added into make it even harder! Switch – when this gets called out, performing students have to change parts at the downbeat of the next measure. Faster/Slower – before beginning performing students let listening students choose a tempo for them… if they dared! Ritardando – slowing down to the end, sounds easy but doing this with another person can be a bit tricky! Forte/Piano – why not mix in some dynamic practice?! Foot tap/Clap – listening students call out a change for performers, to be started at the downbeat of the next measure. Finally, you’re probably wondering why I mentioned competition? Well our students got so involved they’d make each round harder and harder till one of them made a mistake and the other won the Rhythm Duel! They’re already talking about the next time they get to play. Download and print off your copy of the first levels of Rhythm Duels today! I hope your students have as much fun as we did.